Background: Endovascular treatment (EVT) is effective for stroke patients with a large vessel occlusion (LVO) of the anterior circulation. To further improve personalized stroke care, it is essential to accurately predict outcome after EVT. Machine learning might outperform classical prediction methods as it is capable of addressing complex interactions and non-linear relations between variables. Methods: We included patients from the Multicenter Randomized Clinical Trial of Endovascular Treatment for Acute Ischemic Stroke in the Netherlands (MR CLEAN) Registry, an observational cohort of LVO patients treated with EVT. We applied the following machine learning algorithms: Random Forests, Support Vector Machine, Neural Network, and Super Learner and compared their predictive value with classic logistic regression models using various variable selection methodologies. Outcome variables were good reperfusion (post-mTICI ≥ 2b) and functional independence (modified Rankin Scale ≤2) at 3 months using (1) only baseline variables and (2) baseline and treatment variables. Area under the ROC-curves (AUC) and difference of mean AUC between the models were assessed. Results: We included 1,383 EVT patients, with good reperfusion in 531 (38%) and functional independence in 525 (38%) patients. Machine learning and logistic regression models all performed poorly in predicting good reperfusion (range mean AUC: 0.53-0.57), and moderately in predicting 3-months functional independence (range mean AUC: 0.77-0.79) using only baseline variables. All models performed well in predicting 3-months functional independence using both baseline and treatment variables (range mean AUC: 0.88-0.91) with a negligible difference of mean AUC (0.01; 95%CI: 0.00-0.01) between best performing machine learning algorithm (Random Forests) and best performing logistic regression model (based on prior knowledge). 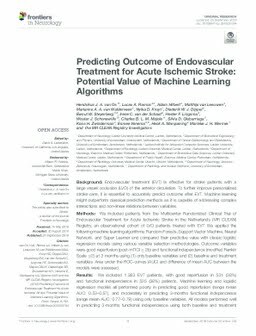 Conclusion: In patients with LVO machine learning algorithms did not outperform logistic regression models in predicting reperfusion and 3-months functional independence after endovascular treatment. For all models at time of admission radiological outcome was more difficult to predict than clinical outcome.